Most extracellular virulence factors produced by Bacillus cereus are regulated by the pleiotropic transcriptional activator PlcR. Among strains belonging to the B. cereus group, the plcR gene is always located in the vicinity of genes encoding the YvfTU two-component system. The putative role of YvfTU in the expression of the PlcR regulon was therefore investigated. Expression of the plcR gene was monitored using a transcriptional fusion with a lacZ reporter gene in a yvfTU mutant and in its B. cereus ATCC 14579 parental strain. Two hours after the onset of the stationary phase, a stage at which the PlcR regulon is highly expressed, the plcR expression in the yvfTU mutant was only 50% of that of its parental strain. In addition to the reduced plcR expression in the yvfTU mutant, a few members of the PlcR regulon showed a differential expression, as revealed by transcriptomic and proteomic analyses. The virulence of the yvfTU mutant in a Galleria mellonella insect model was slightly lower than that of the parental strain. The YvfTU two-component system is not required for the expression of most of the virulence factors belonging to the PlcR regulon. However, YvfTU is involved in expression of plcR, a major regulator of virulence in B. cereus. Bacillus cereus is a Gram-positive, rod-shaped, motile and spore-forming bacterium with opportunistic pathogen properties in human, causing local and systemic infections. B. cereus is mostly observed as a causative agent of food poisoning. This species belongs to the B. cereus group that includes the closely related species Bacillus anthracis, Bacillus thuringiensis, Bacillus weihenstephanensis, Bacillus mycoides and Bacillus pseudomycoides [1, 2]. B. cereus produces several secreted proteins, including enterotoxins, cytolysins, phospholipases and proteases that may contribute to B. cereus pathogenicity. Expression of most of these virulence factors is controlled by the pleiotropic transcriptional activator PlcR [3–5]. This global regulator contributes to B. cereus virulence in mice, in insects  and to rabbit endophthalmitis . Expression of the PlcR regulon starts at the onset of the stationary phase of growth . It results from a cell-cell communication system that requires PapR, a peptide exported and re-imported in the bacterial cell as a mature form via an oligo-peptide permease [9, 10]. The PlcR-PapR active complex binds a DNA target site, designated as the PlcR box, thus activating transcription of the PlcR regulon genes [3, 10]. Bacteria recognize and respond to a variety of environmental stimuli using various signal transduction mechanisms, including two-component systems (TCS) . TCS are characterized by a histidine kinase (HK) sensor coupled with a cognate response regulator. Perception of a particular stimulus by the HK leads to its autophosphorylation. The phosphoryl group is then transferred to the response regulator, usually leading to transcriptional activation of genes. TCS are widespread among bacteria, and the number of TCS encoding genes found in a bacterium is usually proportional to the size of its genome [12, 13]. Genome sequencing of B. cereus strain ATCC 14579 has revealed the presence of 55 sensor kinases [14, 15]. Most of them are also found in other members of the B. cereus group for which the genome sequence is available, including B. anthracis and B. thuringiensis . TCS controlling expression of virulence factors have been shown in several bacteria, including B. cereus. Recently, the B. cereus ResDE TCS which is involved in low oxydo-reduction potential adaptation was shown to control enterotoxin production under anaerobiosis . In contrast, the B. cereus YvrGH TCS, of which the encoding genes are located in the vicinity of the cytotoxin K encoding gene, was not required for expression of this virulence factor . TCS encoding genes are often located in the same chromosomal region as the genes that they control, as for example in B. subtilis with the DesKR, CitST, YycFG, BceRS and LiaRS TCS [19–23]. In the B. cereus group, the TCS encoding yvfTU genes are located in the vicinity of plcR. To determine whether the YvfTU TCS plays a role in the expression of plcR and consequently of the PlcR regulon, the phenotype of a yvfTU mutant constructed in the B. cereus strain ATCC 14579 was analyzed. Genes encoding a TCS (BC5352 and BC5353) were located between 5,263 kb and 5,265 kb on the minus strand of the B. cereus ATCC 14579 chromosome (Fig. 1A). Using BlastP, the deduced amino acid sequences of BC5353 and BC5352 genes appeared to be homologous to both the B. subtilis YocF and YocG (now called DesK and DesR) (37 and 62% identity, with E-values of 2e-60 and 2e-42, respectively) and the B. subtilis YvfT and YvfU (43 and 62% identity, with E-values of 9e-78 and 4e-43, respectively). In B. cereus ATCC 14579, genes encoding a putative ABC transporter (BC5355 and BC5354) were located upstream from the BC5353 and BC5352 genes (Fig. 1A). Orthologous ABC transporter encoding genes were also located upstream from the yvfTU genes in B. subtilis (not shown). The BC5353 and BC5352 genes studied here have been annotated as yocF and yocG in the B. cereus strain ATCC 14579 . However, these genes were previously annotated yvfT and yvfU in ATCC 14579 . Because of (i) their higher sequence homologies with the B. subtilis yvfT and yvfU genes, (ii) their conserved synteny with the B. subtilis yvfTU locus (including ABC transporter encoding genes), and (iii) their previous annotations, the BC5353 and BC5352 genes were named as yvfT and yvfU, respectively, throughout the present work. The B. cereus yvfTU chromosomal region. (A) Map of the B. cereus ATCC 14579 yvfTU chromosomal region. Grey arrows represent ORFs. The position of the kanamycin resistance gene integrated in the chromosome of the mutant to disrupt yvfTU is indicated. Small arrows represent promoters or putative promoters. Function or putative function of gene products: BC5355, ABC transporter ATP-binding protein; BC5354, ABC transporter permease protein; yvfT, two-component sensor kinase; yvfU, two-component response regulator; nprB, metalloprotease; plcR, transcriptional activator; papR, PlcR activating peptide; Black box: PlcR recognition site. Lines annotated by numbers in brackets correspond to RT-PCR amplicons (see text and Fig. 2). In the yvfT promoter region, putative -10 and -35 sigma A boxes (underlined), initiation of transcription (bold underlined) and RBS (bold italic) are indicated In the yvfU 3'-region, one cytosine (bold underlined) which leads to a stop codon (italic underlined) was indicated in the ATCC 14579 genome sequence, but was lacking in our sequence data which gives a different stop codon (bold). The predicted stem-loop at the end of yvfU is represented. (B) Synteny of the yvfTU chromosomal region among the B. cereus group. Taxonomic group determined as previously described . Studied strains were: Group III, B. cereus ATCC 10987; B. cereus ZK (E33L); B. thuringiensis konkukian; B. anthracis Sterne; B. anthracis Ames; B. anthracis Ames 0581; B. anthracis Ames ancestor; B. cereus W, B. thuringiensis Al Hakam. Group IV, B. cereus ATCC 14579; B. thuringiensis israelensis ATCC 35646. Group VI, B. weihenstephanensis KBAB4. Group VII, B. cereus NVH 391/98, B. cereus NVH 883/00. a: truncated in B. anthracis strains. RT-PCR detection of yvfTU , BC5354 and BC5355 in B. cereus strain ATCC 14579. Lane "+": Positive control (PCR on genomic DNA). Lanes "RT": RT-PCR on 500 ng RNA. Lanes "-": Negative control (RT-PCR on 500 ng RNA with a heat-inactivated reverse-transcriptase). Numbers in brackets refer to the positions of the RT-PCR products on the yvfTU locus, as represented on Fig. 1A. RNA extraction was performed on strains grown at 37°C in LB broth and harvested in exponential phase (E) (OD600 1), or 2 hours after the onset of stationary phase (T2). In the strain ATCC 14579, the yvfTU genes were located in the vicinity of plcR (BC5350) encoding a transcriptional regulator and its activating peptide encoding gene papR (BC5349) (Fig. 1A). A putative protease encoding gene, nprB (BC5351), was found between yvfU and plcR. Among the B. cereus group strains, the yvfTU genes were always located in the vicinity of plcR-papR (Fig. 1B). The synteny was conserved, except for nprB which is lacking in some strains of the B. cereus group. The presence or absence of the nprB gene seemed to be correlated to the taxonomic position of the strains [24, 25], according to the genome sequences available up to now in each taxonomic group. Putative motifs present in the deduced amino-acid sequences of yvfT and yvfU were predicted according to the Smart tool: YvfT displays an ATP binding domain (HATPase domain), and a dimerisation and phosphoacceptor domain (PFAM:HisKA_3 domain). YvfT is most probably a membrane protein as revealed by the 4 predicted transmembrane domains in its N-terminal region. This histidine kinase belongs to the class IIa defined by Fabret et al. , or to the class 7 according to Grebe and Stock . YvfU, the cognate response regulator of YvfT belongs to the NarL class of response regulators . YvfU displays a phosphoacceptor site (REC domain) in the N-terminal region. The DNA-binding motif (HTH domain) found in the C-terminal region suggests a transcriptional regulator function. The YvfU TCS corresponds to the reference code 56 defined by de Been et al. . According to the published genome sequence , the YvfU response regulator is smaller in strain ATCC 14579 than in other strains of the B. cereus group (not shown). However, our sequences from 3 independent PCR-amplified yvfU fragments differed from the genome data, by the absence of a cytosine at the position 420 in the yvfU gene which created a frameshift. The yvfU gene was consequently 55 bp longer (Fig. 1A), and the C-terminal-end of YvfU (which contains the HTH domain) included therefore 18 additional amino-acids. Thus, YvfU from the ATCC 14579 strain displays a higher similarity with the other B. cereus group members' YvfU protein (Additional file 1). 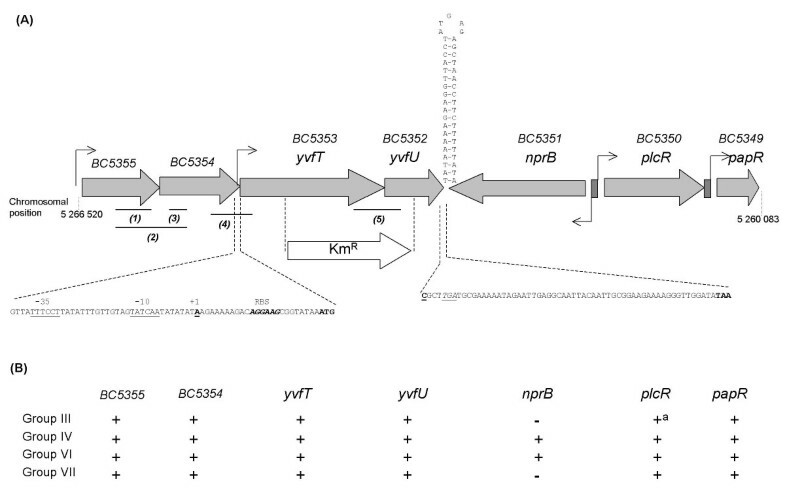 A mutant was constructed in B. cereus ATCC 14579 by interrupting both the yvfT and yvfU genes. 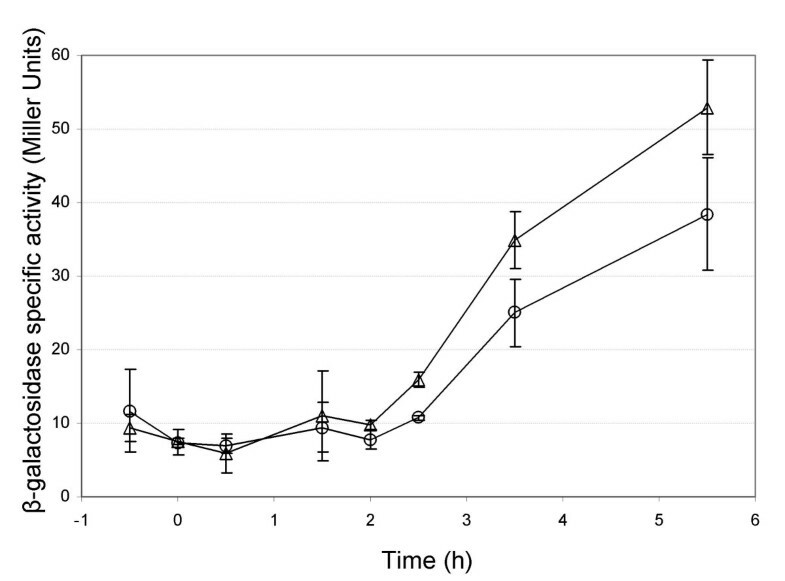 No difference was observed between ΔyvfTU and its parental strain during growth in LB at various incubation temperatures (15°C, 37°C and 42°C) (data not shown). RT-PCR was performed on RNA extracted from ATCC 14579 cells grown either in exponential (OD600 = 1.0) or stationary phase at T2 (2 hours after the onset of stationary phase). The yvfT and yvfU genes were co-transcribed as indicated by the detection of mRNA overlapping both genes, during both exponential and stationary phase (panel 5 in Fig. 2). The genes encoding putative ABC transporters (BC5354 and BC5355, located just upstream from yvfTU) were also co-transcribed in the same growth conditions (panel 2 in Fig. 2). However, a signal overlapping BC5354 and yvfT genes was detected by RT-PCR only on RNA extracted from cells harvested at T2 (panel 4 in Fig. 2). Thus, at certain growth stages, these 4 genes could be co-transcribed as a single operon. The co-transcription of the yvfTU genes alone (i.e. without a co-transcription with BC5355-BC5354) during exponential phase of growth suggested the existence of a specific promoter upstream from yvfT. This result was confirmed by the identification of the 5'-end of the yvfTU transcript mapping 25 bp upstream from the start codon (Fig. 1A), using the rapid amplification of cDNA ends (RACE)-PCR technique. A yvfT'lacZ transcriptional fusion was therefore constructed on a plasmid and transferred in both B. cereus ATCC 14579 and ΔyvfTU strains. Measurement of β-galactosidase activity throughout the kinetics of growth revealed a very low expression in both strains during the exponential phase and until two hours after the onset of stationary phase (mean values about 10 Miller units, Fig. 3). Then, β-galactosidase activity increased in both strains. These results indicate that yvfTU was transcribed from its own promoter at a basal level in exponential phase of growth and transcription was increased during the stationary phase. No significant difference between the yvfT-directed lacZ transcription in the 2 strains at any time of the growth culture was observed (P > 0.05, Student's t test). yvfT directed lacZ expression in B. cereus WT or yvfTU mutant strains. β-galactosidase activity was measured in either the WT strain (circles) or in the yvfTU mutant (triangles) harbouring pHT-yvfT'Z (649 bp yvfT promoter region cloned upstream from the promoterless lacZ reporter gene in pHT304-18Z). Time 0 indicates the onset of the stationary phase of growth. Each curve is the mean value of triplicate measurements, representative of 3 independent experiments. Bars represent standard deviation. Because RT-PCR experiments revealed a co-transcription of yvfTU with the two BC5355 and BC5354 genes at T2, quantification of the promoter activity of the BC5355-BC5354-yvfT-yvfU operon, was performed by constructing a BC5355'lacZ transcriptional fusion. Measurements of the β-galactosidase activity at T2 in the B. cereus ATCC 14579 and ΔyvfTU strains were (mean ± sd) 28 ± 4 and 22 ± 13 Miller Units, respectively, and were not significantly different (P > 0.05, Student t-test). Thus, disruption of the chromosomal yvfTU genes did not alter the transcription of the plasmidic yvfTU promoter, nor that of the plasmidic BC5355 promoter, revealing that, in the tested conditions, the yvfTU operon was not autoregulated. A transcriptional fusion between the plcR-promoter region from B. cereus strain ATCC 14579 and the lacZ reporter gene was constructed (Table 1) in order to determine the levels of plcR transcription in both the WT and ΔyvfTU strains throughout the kinetics of growth (Fig. 4). Measurement of β-galactosidase activity revealed that during the exponential phase, the plcR expression level was constant, ranging from 20 to 30 Miller units in both strains (no significant difference between the two strains). In contrast, during the stationary phase, plcR expression increased in both strains, but this increase was faster in the WT strain than in ΔyvfTU. Thus, during stationary phase, a higher plcR expression was detected in the WT strain as compared to that in ΔyvfTU (P < 0.05). plcR directed lacZ expression in B. cereus WT or yvfTU mutant strains. β-galactosidase activity was measured in either the WT strain (circles) or in the yvfTU mutant (triangles) harbouring pHT-plcR'Z (plcR promoter region cloned upstream from the promoterless lacZ reporter gene in pHT304-18Z). Time 0 indicates the onset of stationary phase. Each curve is the mean value of triplicate measurements, representative of 3 independent experiments. Bars represent standard deviation. To study the expression of the PlcR regulon in ΔyvfTU, in comparison with that of its parental strain, a transcriptomic approach was performed. Bacteria were grown in LB medium and were harvested two hours after the onset of the stationary phase of growth. At this time, 80% of the total amount of the extracellular proteins is produced in a PlcR-dependent manner . The PlcR regulon has recently been thoroughly defined by a microarray-based approach . Among the 45 genes belonging to this regulon, a significant differential expression of at least 1.5 fold was observed between the 2 strains for 11 of them by the transcriptome analysis (Table 2). These results revealed that the yvfTU mutation changed the expression of only a small part of the PlcR regulon at the transcriptional level, in the growth conditions used in this study. a Genes without a PlcR box found directly upstream, but located in a putative PlcR-regulated operon. b Absolute ratio of expression in the yvfTU mutant vs WT. Up- or downregulation of more than 1.5 fold are presented. c Log2 of the absolute ratio. Negative M-value, downregulated in the mutant; positive M-value, upregulated in the mutant. M-values of more than 0.59 or less than -0.59 (corresponding to an 1.5 fold up- or downregulation in the mutant, respectively) are presented. Eight of these genes showed a reduced expression in ΔyvfTU, including plcR and its activating peptide encoding gene papR. Relative real-time quantitative PCR (qRT-PCR) was performed and confirmed that in ΔyvfTU, the plcR mRNA levels represented 0.48 fold (mean of 3 independent experiments, range 0.31–0.60) of the mRNA levels in the WT. Some genes such as nprB, nheAB, plcB, encoding toxins or degradative enzymes, were also downregulated (Table 2). In contrast, the three genes encoding the haemolysin BL were overexpressed in the mutant. The hblC mRNA levels in qRT-PCR were 2.49 fold (range 2.39–2.60) higher in ΔyvfTU than in the WT and confirmed the results of the transciptomic analysis. Complementation of the ΔyvfTU strain was performed by introducing the yvfTU genes under the control of their own promoter on a plasmid (Table 1). The plcR mRNA level was quantified in the resulting strain harvested 2 hours after the onset of stationary phase. In the complemented ΔyvfTU strain, the mRNA level of plcR was restored: it was 1.4 fold higher than in the WT strain and 1.7 fold higher than in the WT strain harbouring the control plasmid (pHT304). Because most virulence factors belonging to the PlcR regulon are extracellular proteins, the extracellular proteome from 4 cultures of each of WT and ΔyvfTU strains was also analyzed. Identification of proteins on gels after a two-dimensional electrophoresis was based on previous spots annotations performed in similar experimental conditions . For confirmation, 8 spots were analysed by Mass-Spectrometry. Using the software ImageMaster Platinum, spot volume quantification was performed after normalization and a Kruskal-Wallis (KW) test was applied to detect reproducible differences between the extracellular proteomes of the two strains. Some differences were observed for spots corresponding to NprB and PC-PLC (Fig. 5). The three spots corresponding to three isoforms of NprB were found in a significant higher amount in the extracellular proteome of the WT (mean 7.09% vol, range 5.28–9.57) when compared to that of the yvfTU mutant (mean 3.31% vol, range 1.54–5.45) (differences in the KW test significant at P = 0.02). Similarly, the mean % vol of spots corresponding to PC-PLC (encoded by the plcB gene) represented 4.24 (range 3.22–6.16)% vol and 1.26 (range 0.16–2.89)% vol in the extracellular proteomes of the WT and ΔyvfTU, respectively (difference significant in KW test at P = 0.05). 2D-GE of WT and yvfTU mutant culture supernatants collected 2 hours after the onset of stationary phase. Spots found in lower amount in the extracellular proteome of the yvfTU mutant correspond to NprB and PC-PLC proteins, as confirmed by Mass Spectrometry identification. The different spots correspond to isoforms of the same protein, with distinct charges but identical molecular weights. The gel areas shown are located around 37 kDa with a pI between 5.5 and 6 for NprB, and 25 kDa with a pI between 6.0 and 7.0 for PC-PLC. The total amount of Nhe represented 8.21 (range 3.67–12.38)% vol and 5.20 (range 2.08–8.00)% vol (for NheA) and 6.14 (range 5.39–7.69) and 4.66 (range 3.59–7.24)% vol (for NheB), in the WT and ΔyvfTU extracellular proteomes, respectively. Although differences were not significant (P > 0.05 in KW test), in each of the 4 runs, the amount of NheA and NheB was always higher in the gels of the WT extracellular proteome than in those of ΔyvfTU (differences significant at P = 0.03 for NheB and at P = 0.06 for NheA in a paired t-test). Apart from those differences, the extracellular proteomes of both strains were similar. In particular, the amount of the other extracellular proteins known to be expressed in a PlcR-dependent manner was not significantly affected by the yvfTU mutation, confirming the small number of changes in expression of the PlcR regulon observed by the transcriptomic analysis. Virulence of the yvfTU mutant was estimated in a Galleria mellonella infection model. Injection of various doses (200 to 20,000 cfu) of WT and yvfTU mutant was performed into the G. mellonella hemocoel (blood of the insect). By using a Probit analysis software, the LD50 at 24 hours post infection were estimated. For the wild type the LD50 was 2.5 × 103 (95% confidence limits from 1.8 × 103 – 3.6 × 103) CFU and for the ΔyvfTU mutant the LD50 was 4.2 × 103 (95% confidence limits from 3.2 × 103 – 5.8 × 103) CFU. Test of parallelism and the virulence ratios at the LD50 level showed a significant ((P < 0.05, X2 test) but small decrease (1.6 fold with (1.3–2.1, 95% confidence limits)) in virulence with the ΔyvfTU mutant compared to the WT. No difference between ΔyvfTU and the WT in time-to-death was noticed (data not shown). When grown on sheep blood agar, the ΔyvfTU and the WT strains displayed an identical hemolysis phenotype. The two strains did not show significant difference in cytotoxicity on HeLa cells and on macrophages (data not shown). Some orthologs of the B. cereus yvfTU genes are found in other Bacillus species. However, in none of these organisms the YvfTU function has been studied. Although the exact function of many TCS is unknown, the TCS encoding genes are often located in the same chromosomal region as the genes that they control. Among the B. cereus group members, the yvfTU genes are highly conserved, and are always located in the vicinity of plcR. Because of this conserved synteny, we hypothesized a link between YvfTU and PlcR. Expression of plcR was therefore studied in a yvfTU mutant. The lower β-galactosidase activity measured in ΔyvfTU harboring a plcR'lacZ transcriptional fusion revealed a transcription of plcR partly depending on YvfTU. This dependence between YvfTU and plcR expression was confirmed by transcriptome analysis and quantitative real-time PCR. Because the expression of plcR was affected by the yvfTU mutation, we wondered about a consequently modified expression of the PlcR regulon. The transcriptome and the extracellular proteome of both the WT and ΔyvfTU strains were analyzed, at the time of maximum protein concentration in the culture supernatant  and when 80% of the total amount of the produced proteins is expressed in a PlcR-dependent manner  (i.e. two hours after the onset of the stationary phase). At this stage, yvfTU genes were transcribed, and the plcR transcription was partly YvfTU-dependent. Despite a lower level of plcR mRNA in ΔyvfTU, the transcriptomic and proteomic analysis both revealed that the expression of the PlcR regulon was mostly not affected by the yvfTU mutation. This suggests that PlcR can play its regulatory role even when expressed at a low level. However, our results revealed that the decrease in plcR mRNA levels caused by the yvfTU mutation was concomitant to a differential expression at the transcriptional level of 11 PlcR-regulated genes, with 8 genes showing a reduced expression in ΔyvfTU. An increase in expression of the 3 genes belonging to the hbl operon was observed in ΔyvfTU where plcR is expressed at a lower level, while hbl is known to be expressed in a PlcR-dependent manner [3, 4]. Although performed in different growth conditions, such a lack of congruence between the trends of transcription of several PlcR-regulated genes (including hbl) and expression of plcR itself has been previously shown . Furthermore, the recent discovery of the involvement of another regulator (Fnr) in hbl expression emphasizes the fine regulations occurring in B. cereus in addition to the PlcR regulation [32, 33]. The differential response of several genes among a particular regulon has been observed many times elsewhere, and it was recently suggested that in B. cereus, some diversity in the regulation of gene expression occurs within the PlcR regulon . All these findings, coupled with our results, suggest that expression of hbl and some other members of the PlcR regulon can undergo subtle regulations which also involve yet unidentified factors, different from PlcR. For several genes showing reduced expression at the transcriptional level in ΔyvfTU, a concomitant decrease in the amount of their products was detected by 2D gel analysis. In some cases, differential expression was only observed with the transcriptomic approach (for example, the Cereolysin O encoding gene). The relatively low levels of differential expression observed with the transcriptome analysis suggest that the proteomic approach was less sensitive in our conditions. Furthermore, various post-transcriptional regulations might explain the lack of correlation between transcriptomic and proteomic approaches, as reported in several studies on other organisms (for example, see references [34–37]). In bacterial pathogens, several TCS mutants present attenuation in virulence . In our study, the virulence of ΔyvfTU in the G. mellonella insect was also slightly lower than that of the WT strain. The reduced expression of nprB, plcB and nheAB coupled with the lower amount of their products found in the extracellular proteome of ΔyvfTU may account for this reduction in virulence. However, this only slightly impaired virulence is not surprising, as ΔyvfTU did not present a major alteration of the PlcR regulon, and considering the importance of this regulon in B. cereus insect virulence . Expression of chromosomal genes not regulated by plcR was also affected by the yvfTU mutation, as observed with the transcriptomic analysis (additional file 2). Among them, 29 and 25 genes showed respectively higher and reduced expression by 2 fold or more. However, no major pathway was over-represented in this gene list, giving no clue for the identification of a signal triggering the activation of the YvfTU TCS. An alignment of 1,000 bp promoter regions of the genes listed in additional file 2 was performed using the MEME programme. However, no conserved sequence was identified, suggesting that no highly conserved regulatory motif was responsible for an YvfTU-dependent differential expression in these promoter regions. This work showed that YvfTU and PlcR are genetically linked. A functional link was also shown by the identification of a YvfTU dependent plcR expression. The decreased plcR expression observed in ΔyvfTU only slightly modified the expression of the PlcR regulon, and slightly decreased the virulence of B. cereus in an insect model. A subtle regulation for some virulence factors produced by B. cereus exists in addition to the PlcR regulation. All bacterial strains and plasmids used in this study are listed in Table 1. E. coli and B. cereus cells were routinely grown in Luria broth (LB) medium with vigorous agitation at 37°C. When required, the antibiotic concentrations used for bacterial selection were: erythromycin at 10 μg ml-1 or kanamycin at 150 μg ml-1 for B. cereus and ampicillin at 100 μg ml-1 for E. coli. Bacteria with the Lac+ phenotype were identified on LB agar containing 40 μg ml-1X-Gal. Columbia agar plates containing 5% sheep blood (BioMérieux) were used to assay the hemolytic activity of the strains. tblastn alignments were performed on NCBI web site: http://www.ncbi.nlm.nih.gov/BLAST/. Protein domains in YvfT and YvfU were identified using SMART software [40, 41]. MEME programme was used to perform alignments of promoters of upregulated and downregulated genes in the yvfTU mutant . Plasmid DNA was extracted from E. coli and B. cereus by a standard alkaline lysis procedure using the Wizard SV miniprep purification system (Promega), with the following modification in the first step of the lysis procedure for B. cereus: incubation at 37°C for 1 h with 5 mg of lyzosyme (14,300 U mg-1). Chromosomal DNA was extracted from B. cereus cells harvested in mid-log phase as described previously . Restriction enzymes and T4 DNA ligase were used as recommended by the manufacturer (Promega). Oligonucleotide primers were synthesized by Eurogentec. PCR was performed in a GeneAmp PCR system 2400 thermal cycler (Perkin-Elmer), using the Expand high fidelity DNA polymerase (Roche). Amplified DNA fragments were purified by using the PCR purification Kit (Roche) and separated on 0.7% agarose gels after digestion. Digested DNA fragments were extracted from agarose gels with a centrifugal filter device (montage DNA gel extraction kit; Millipore). All constructions were confirmed by DNA sequencing (GenomeExpress, Grenoble, France). Electroporation to transform B. cereus was used as previously described . Total RNA was extracted from B. cereus ATCC 14579 wild-type (WT) cells grown aerobically in LB medium at the end of exponential phase (OD600 = 1.0), or two hours after the onset of stationary phase (T2), using the RNA extraction Pro-blue kit as recommended by the manufacturer (Q-Biogen). cDNA synthesis from 1 μg of total RNA was performed by using AMV-RT polymerase according to the instructions given by the RT-PCR kit (Roche). Specific amplifications were performed with the primers 5355-F and 5355-R (Table 3) for the BC5355 gene, 5355-F and 5355-54-R for a region overlapping BC5355 and BC5354, PyvfT-F and 5354-R for the BC5354 gene, 5Up-KR and yvfT-54-R for a region overlapping BC5354 and yvfT, and yvfTU-F and yvfTU-R for a region overlapping yvfT and yvfU. This step was coupled with 30 cycles of PCR amplification with Expand-HighFidelity polymerase as recommended (Roche). The yvfTU transcription start site was determined by the RACE-PCR kit (Roche) using yvfT-R2 and yvfT-R3 oligonucleotides (Table 3), following the manufacturer's instructions. The two contiguous genes encoding the TCS YvfTU were interrupted by allelic exchange with a cassette conferring kanamycin resistance (KmR) in B. cereus ATCC 14579 as previously described . Briefly, a fragment of 912 bp corresponding to the upstream region of BC5353 (yvfT) was PCR amplified using primers 5Up-KR and 3Up-KR (Table 3). Similarly, a 967 bp fragment corresponding to the downstream region of BC5352 (yvfU) was PCR amplified using primers 5Dn-KR and 3Dn-KR (Table 3). PCR fragments were cloned in the pUC18 plasmid, in accordance with the endonuclease restriction sites previously introduced in the primers (Table 3). In parallel, the 1.5 kb fragment corresponding to the aphA3 kanamycin resistance gene with its own promoter was PCR amplified using primers Km5in and Km3in, and pDG783 as a DNA template [46, 47], and cloned in the pHT304 plasmid (Table 1). The DNA fragments corresponding to the upstream and downstream yvfTU region and the KmR cassette were digested with the appropriate enzymes, purified and cloned altogether in the NcoI and BamHI sites of the thermosensitive plasmid pMAD (Table 1). 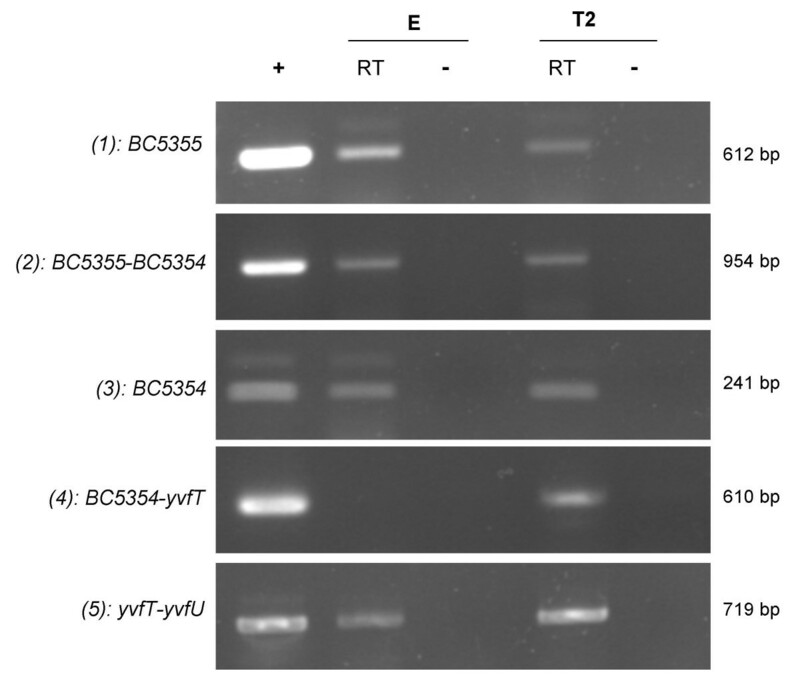 Ten μg of the recombinant plasmid pMADΔyvfTU were used to transform B. cereus ATCC 14579, and subjected to allelic exchange as previously described . Strains that were resistant to kanamycin and sensitive to erythromycin arose through a double cross-over event in which the chromosomal yvfTU copy was replaced with the KmR cassette. The chromosomal allele exchange in the yvfTU mutants was checked by DNA sequencing of PCR fragments amplified using the primers couples Km5out/5Up-KR and Km3out/3Dn-KR. Complementation of the mutant was performed as follows: a PCR amplified fragment using primers PyvfT-F and Cp-yvfTU was cloned between the PstI and EcoRI sites of pHT304 and introduced in B. cereus ΔyvfTU by electroporation. The DNA fragment harbouring the promoter regions were PCR amplified and digested according to the endonuclease sites introduced in the primers (see Table 3). The lacZ transcriptional fusions were constructed by cloning these DNA fragments between the corresponding sites of the low copy plasmid pHT304-18'Z . The recombinant plasmids were introduced into B. cereus ATCC 14579 WT and ΔyvfTU strains by electroporation. B. cereus strains harbouring plasmids with lacZ transcriptional fusions were cultivated in LB medium at 37°C. β-Galactosidase specific activities were measured in triplicate samples from each culture as previously described  and were expressed in units of β-galactosidase per milligram of protein (Miller units). Total proteins in the sample were quantified using the Bradford method (BioRad protein assay). Experiments were repeated three times. Error bars indicate standard deviations of triplicate measurements. 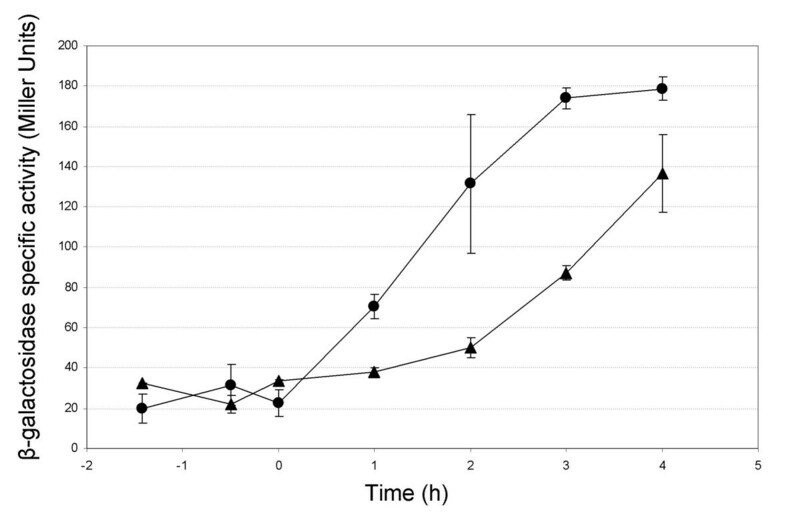 Three independent cultures of B. cereus ATCC 14579 WT and ΔyvfTU strains were cultured in LB medium at 30°C with shaking and harvested 2 hours after the onset of the stationary phase of growth (T2), as described previously . Total RNA was extracted with the protocol described previously  modified as follows: frozen cell pellets from 10 ml culture were supplemented with 1 ml of TES buffer (0.03 M Tris pH 8.0, 0.005 M EDTA, 0.05 M NaCl). Disruption of the cells was performed by adding 0.3 g sterile glass-beads (Sigma) followed by a 40 sec. run on a FastPrep Instrument (MP Biomedical). For each slide, cDNA was generated as described previously on 20 μg of isolated RNA from the wild-type strain and 20 μg of RNA from the mutant strain . After purification, the cDNA's were labeled with Cy3 (wild-type) and Cy5 (mutant) and vice versa for the dye-swapped slides. The combined cDNA's of wild-type and mutant were hybridized onto a micro-array of 70-mer oligonucleotides, which represent all 5,255 open reading frames of the B. cereus ATCC 14579 genome (design: see ). As described previously , the slides were incubated overnight at 42°C and, after washing, scanned with an Axon 4000B scanner (Molecular Devices Corp., California). Further processing of the scanned slide and the subsequent data analysis was performed as described , using GenePix Pro, version 6.0 software (Molecular Devices Corp.). Real-time RT-PCR was performed on a Light-Cycler instrument (Roche) as previously described . Briefly, the LightCycler RNA Amplification kit SYBR Green I (Roche) was used according to the manufacturer's instructions, with the following modifications: 5 ng of total RNA were used as a template; the reverse transcription step was performed at 50°C, and the annealing temperature during the 45 cycles of amplification was 50°C. Oligonucleotides listed in Table 3 with a name beginning with "LC" were used for Real-time PCR. PCR amplification were performed on 500 ng of each RNA sample, in order to check for absence of contaminating DNA. The mRNA level changes for each gene were normalized to the RNA level of the ssu gene encoding 16S RNA and quantified as previously described . Independent cultures of WT (n = 4) and ΔyvfTU (n = 4) were performed as indicated above for transcriptome analysis. As previously described , the supernatant of harvested cultures was filter-sterilized and proteins were precipitated with deoxycholate-tetrachloroacetic acid method. After ethanol:ether (vol/vol) washing, the protein pellet was stored at -80°C until use. Quantification of the protein content in the samples was performed by the Bradford method. For both strains, 100 μg of total proteins were loaded on an immobilized pH gradient strip (pH 4 to 7, 17 cm length, BioRad). After the isoelectro-focalisation, the strips were loaded on 12% polyacrylamide gels before the second dimension was run. Gels were silver stained , scanned, and analyzed with the ImageMaster platinum software (Amersham Biosciences) using the total spot volume normalization procedure. Four electrophoresis runs were performed with two gels, one of each WT and one of each ΔyvfTU supernatants. Finally, 8 gels were analyzed. Statistical analysis of relative spot quantification was performed as follows: comparison of spot relative volumes in 4 replicate cultures of the extracellular proteomes of both strains was carried out using Kruskall Wallis non parametric test. A paired t-test was used to detect differences in spots volumes between strains in each of the 4 different runs (Systat version 9; SPSS; Chicago, IL, USA). When necessary, a Coomassie-Blue staining [51, 52] was performed on gels loaded with 500 μg of proteins, and spots were excised from the gels and digested with 0.1 to 0.5 μg of trypsin (Promega) at 37°C during 6 h. The digested proteins were analysed by MALDI-TOF MS on the PAPSS (Plateau d'Analyse Protéomique par Séquençage et Spectrométrie de Masse) at INRA Jouy-en-Josas, France. Peptide mass fingerprints were analyzed with ProteinProspector and Mascott softwares using the B. cereus ATCC 14579 genome database . Cytotoxicity assay was performed on HeLa cells and murine macrophages as described previously [43, 54]. The virulence-related properties of yvfTU were assessed by comparing the killing effect of the B. cereus WT and ΔyvfTU strains by infection in 5th instar (last larval stage before pupation) Galleria mellonella larvae. G. melonella eggs were hatched at 25°C and the larvae reared on beeswax and pollen (Naturalim). Groups of 20 G. mellonella larvae, each weighing about 200 mg, were used. Direct injection into the hemocoel was performed with various doses (ranging from 200 to 20,000 cfu) of vegetative bacteria, collected during exponential growth (OD600 = 1). Tests were run 5 times with 4–5 different doses per test. Infected larvae were kept at 37°C and mortality was recorded at 24 H and 48 h. The 50% lethal doses (LD50s) values were estimated by Probit analysis at 24 H post infection [55, 56]. The Probit program (Praxeme, France) tests for the linearity of dose-mortality curves, provides lethal doses and the slope of each dose-mortality line. It tests the parallelism of 2 or more dose-mortality lines and determines the virulence ratio between the bacterial strains. Using the X2 (Chi2) test, the ratio is considered to be significantly different (P < 0.05) when the confidence limits do not include the value 1. Nathalie Gilois and Mireille Faurobert are greatly acknowledged for excellent advices in proteome experiments. We also acknowledge Céline Henry for the MS-analysis, Frédéric Carlin for many helpful discussion, Lucien Botella and Christophe Buisson for technical assistance, and A. Zigha, O. Ouhib and C. Duport for gift of some primers. This work was supported by INRA (Institut National de la Recherche Agronomique) and partly from a Grant ANR-05-PNRA-013. It was also supported by the Norwegian Research Council through a Strategic University Program and the Consortium for Advanced Microbial Sciences and Technologies (CAMST-FUGE). JB designed the study, performed the majority of the experiments, analysed the data, and wrote the manuscript. KS performed the transcriptome experiments, CM performed the proteome experiments, CD performed the phenotypic characterisation of the mutant, MG participated in the design of the proteome experiments, CNL analysed the data of the insect virulence experiments and contributed to writing, NR did cytotoxicity assays. ABK, CNT, DL and VB participated in the design of the study. VB participated in the analysis of the data. All authors read, critically revised, and approved the final manuscript.